I'm kind of funny about the color of mine and the season it is. I just cannot carry a black purse in the spring and summer. Cannot do it! Like, April first is my cut off date for black purses. I decided grey might work in any season (and I've been wearing a lot of grey) so I commissioned my bestie to knit me a grey purse for Christmas. What? I knew what I wanted so I asked for it. Problem is, she had to knit or crochet ALL THE THINGS for Christmas gifts so she didn't finish the strap of my purse. I'm still waiting.....sniff. If you know me you know I too knit and crochet, so why didn't I just make myself a purse? Because my friend is BETTER than me. Truth. She also knows how to fiddle with fabric, which means my purse gets a lining, which is even better! So what do I carry around in my purse? I'm glad you asked! Oh, you didn't ask? Well you should have, because what a woman carries in her purse says a lot about her. My good friend Carin gave this to me to be something to focus on when Mark was in the hospital. 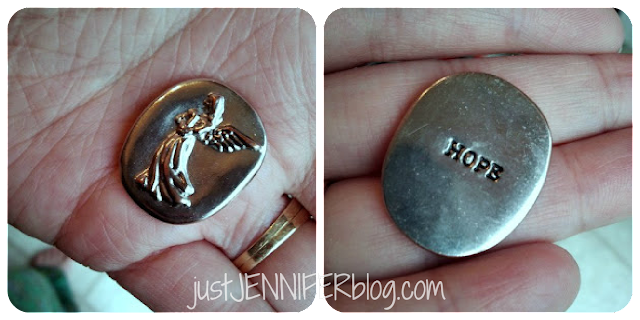 I knew it was in my purse, but I had completely forgotten that HOPE was stamped on the back. Which is the word I chose for 2013, and just added to my header. There are a few other items, like keys, Purel and a pen, and of course I always slip my phone in. My husband and kids often ask me to carry things for them. Oh, and I tend to collect many a receipt, much to my dismay. 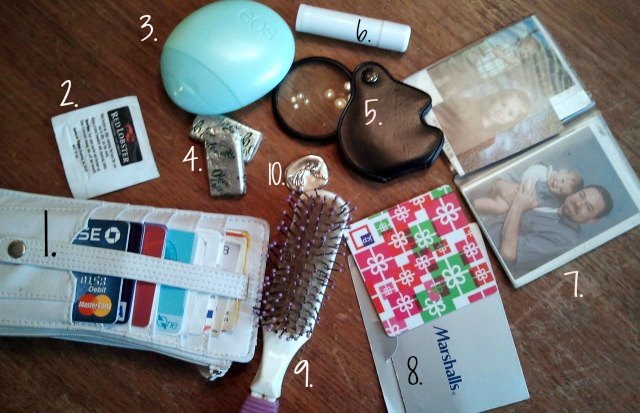 I carry it all in the smallest purse possible. No giant mom bag for me!